Theatre-lovers should take advantage of a rare opportunity to see a fine production at the Stratford Festival of Ibsen’s fascinating second-last play John Gabriel Borkman (1896). From the point of view of the history of Western drama, the play allows viewers to see the transition of drama from the movement of Realism, for which Ibsen is best known, to that of Symbolism, which followed. The play itself concerns the battle of the older generation for control of the younger – a battle the older generation is doomed to lose. The subject is reconciliation – reconciliation between people, with old age and with failure. It is a sombre theme but one that will resonate with anyone who has had to come to terms with unhappy events in the past. 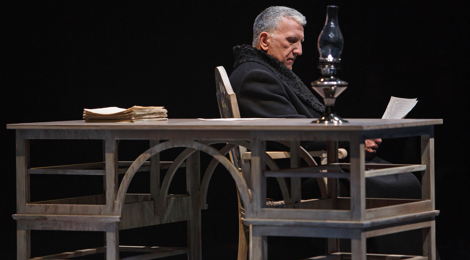 Stratford brings out the play’s profundity in a haunting, beautifully staged production. Ibsen moves the action of Borkman from the realm of Realism to that of Symbolism by making the elements of conflict in the play just slightly more schematic that they would be in a Realist play and the goals of the conflict just slightly more abstract. John Gabriel Borkman (Scott Wentworth) was a miner who rose in life to become a successful banker. In a scheme that could come from recent newspaper headlines, Borkman used his clients money to fund the takeover of various companies in the area with the goal of creating a financial, manufacturing and transportation empire. His misuse of funds was discovered by a lawyer before Borkman’s schemes returned any dividends and Borkman was sent to prison for eight years. Now Borkman and his wife Gunhild (Lucy Peacock) live in disgrace. Gunhild is so furious at her husband for ruining their reputation that ever since his release from prison she has lived on the first floor of their home and Borkman on the second floor, neither trespassing into the other’s territory. Gunhild, however, is constantly reminded of Borkman’s presence by his ceaseless pacing back and forth above her. with her. Ella wants this because she effectively raised Erhart since during Borkman’s incarceration, Gunhild was so distraught she could not raise Erhart herself. Ella’s plan, however, will thwart Gunhild’s grand plan involving Erhart. The one dream that keeps Gunhild alive is that Erhart will make full restitution for Borkman’s crime and will restore the Borkman family’s name and honour. The fact that none of the three members of the older generation have taken into account is that Erhart, now 22 year old, may have his own plans that have nothing to do with his family. 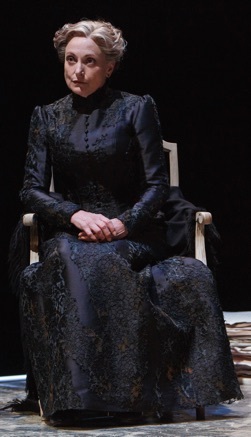 The play has four acts as do all of Ibsen’s Realist plays, but Ibsen uses these acts in a new way. Act 1 focusses on the battle royal between Gunhild and Ella for possession of Erhart. Act 2 gives us the background to the story and to Borkman and Ella’s relationship which in the telling becomes rekindled. Act 3 brings revelations from Erhart that stun Gunhild, Ella and Borkman. At this point the plot, if it were solely a Realist drama, would end. Act 4 moves beyond Ibsen’s usual conclusion of revealed secrets to a more profound meditation on how the three members of the older generation reconcile themselves to the news they learned in Act 3. This is the first time Ibsen devotes an entire act to characters’ contemplation of the previous action of the play. In an extraordinary move Ibsen allows Borkman to rise to the stature of a King Lear and Gloucester combined in one. Director Carey Perloff has shaped the action with great care so that it rises gradually but relentlessly from the first chilly encounter between Gunhild and Ella to the surprising apotheosis at the end. The first act battle itself is a masterpiece of direction where suspicion and reticence slowly give way to bitter accusations and displays of power. Lucy Peacock and Seana McKenna last faced off as a warm Mary Stuart and an icy Elizabeth I in Friedrich Schiller’s Mary Stuart in 2013. This time they deliberately play against type with McKenna as the warm Ella versus Peacock as the icy Gunhild. While it is fascinating to watch and is admirable that the two wish to test themselves, it does seems that both require more effort to play the roles than they would if McKenna played Gunhild and Peacock Ella. McKenna, in particular, has a natural tendency to lend her voice an ironic edge which she so rigorously suppresses as Ella that she also seems like a different actor. Meanwhile, Peacock with equal force hardens her tone as Gunhild. As it turns out, this effort on the part of the actors works in favour of the play since it feeds into the tension that exists between these twin sisters and their long-held animosities. Scott Wentworth gives a fine performance as Borkman, a man whose years in prison and now in the prison of his home have only hardened his megalomania. Far from being repentant, Borkman lives in the delusion that the great purpose of his schemes will be recognized and that the bank will be sending a messenger at any moment to offer him the position of manager again. Borkman’s eternal pacing of the floor is a sign of his waiting for this message to arrive. Wentworth shows us a man already unhinged, one whose love of gold has displaced his love for human beings. When near the end of the play Borkman’s delusions finally overcome his reason entirely, Wentworth’s performance becomes absolutely chilling. Borkman’s position but one who is so hopelessly naive that you have to laugh anyway. In Act 3, however, Foldal gains an insight lost on the others, so that Ziegler accomplishes the hard task of changing our perception so that we laugh with his character instead of at him. Of the younger generation, Erhart Borkman is clearly the most important. Why the Festival should have cast Antoine Yared in such a role is a mystery since as an actor he still requires basic vocal work to prevent his nasalizing all his speeches when he projects. Yared gets across the basics of his character’s growing impulse for independence in the face of his parents’ and aunt’s schemes for him, but there is more nuance that he could bring to the role. In the claustrophobic world of the play, the character of Fanny Wilton is a breath of fresh air. She is a wealthy divorcée in her thirties, independent, self-assured and, unlike the Borkmans, cares nothing about what others think of what she says or does. According to the stage directions, she first enters “in evening dress, and with outer wraps”, so it is odd that designer Christina Poddubiuk should have her dressed like a tart in a shortish red and black dress with sheer arms and upper bodice. Despite this misleading interpretation of the source of Mrs. Wilton’s independence, Sarah Afful presents the character with great poise and dignity. When spoken to with disdain, Afful’s Wilton does not respond in kind but speaks plainly and truthfully. Given Afful’s fine, assertive performance it is no wonder that Erhart seeks out her company rather than that of his family. Providing excellent support are Deidre Gillard-Rowlings as Gunhild’s loyal maid and Natalie Francis as Frida, Foldal’s talented young daughter. One aspect of Poddubiuk’s set is initially puzzling but eventually makes sense. She has placed a white LED lighting strip around the perimeter of the stage which clashes with her period furniture and the character’s costumes. Its main effect is to set off the stage in its theatre-in-the -round configuration as even more of an island than it already is. What one notices is that the younger characters like Erhart, Mrs. Wilton and Frida and the older character Foldal enter and exit the stage stage freely whereas Gunhild and Borkman appeared marooned on this island. Ella enters onto the stage but then appears as marooned as her sister and brother-in-law. It may be that Perloff is illustrating how confined these last three characters are by their unrealizable dreams for the future. The rim of light also demonstrates how small the material “kingdom” is which Borkman thinks is infinite. This late masterpiece by Ibsen is not staged as often as it should be. It was last seen in Toronto in 2007 in a perfectly awful production directed by Leah Cherniak for Soulpepper. Stratford now gives audiences a chance to see a production that respects the text and does not try to force it into some bizarre directorial concept. Anyone interested in Ibsen, in the history of drama or in a spellbinding and profound drama about the conflict of age and youth should make sure to see it. Photo: (from top) Scott Wentworth as John Gabriel Borkman; Lucy Peacock as Gunhild; Seana McKenna as Ella. ©2016 David Hou.